What makes us choose to move? Have you ever thought about what intentional movement you have a passion for that gives you reasons to pursue the activities? Do you delight in dancing? Do you enjoy the outdoors on hikes? Is it the company you keep? Are there personal achievements you’re reaching for? I asked someone recently, “What movement do you have a passion for?” and he’d never thought about it that way. He was stuck “exercising” because someone told him “he had to.” He need time to wonder about whether there was any movement that was his choice or his passion. If you’ve only ever felt a sense of obligation to choose some movement, what would happen if you could choose based on what you wanted? What would you choose to do today? What do you need to take that first step towards movement you truly enjoy? Ever heard yourself or someone say, “I only did this one thing, does that even count?” Yes, all movement counts. You’re the person in charge of what matters in your life and what choices you make. Maybe today you’re still recovering from illness or injury. Of course the efforts you made for movement count, they were difficult! You overcame things to make this happen! Maybe today you’re overwhelmed by life and the things around you. Of course the efforts you made for movement count, look at what it took for you to do these things! Maybe today you’re not feeling like you used your week, your month, or your year very well. Any choice you make today counts for today. Every day is different. Every day is now. Each day is all we have. 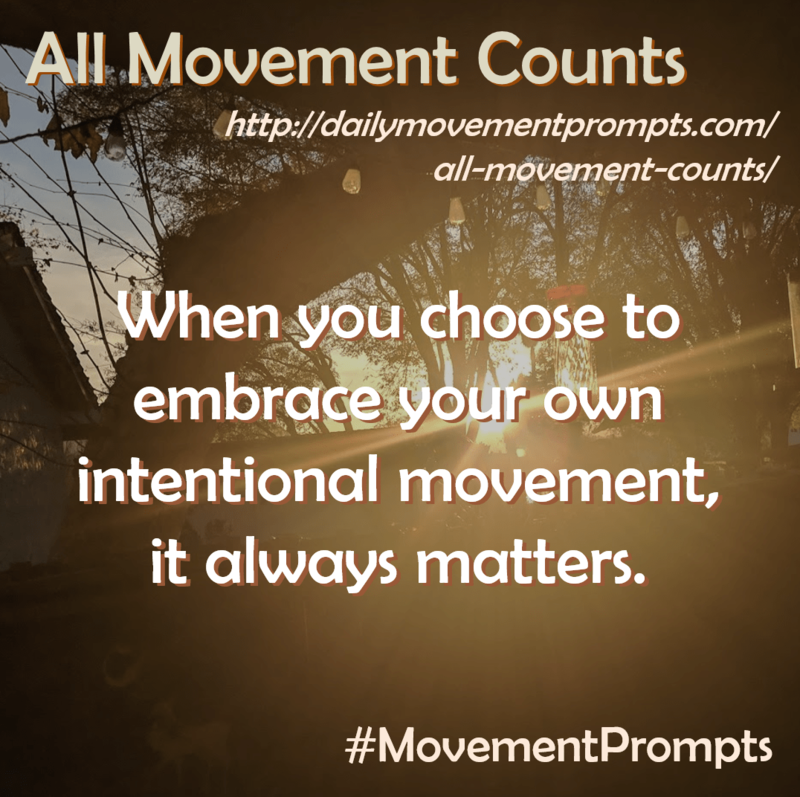 When you choose to embrace your own intentional movement, it always matters. And it always counts. Because you matter. When you find yourself successfully moving and enjoying yourself, which habits are part of those routines? Do you do best when you’ve set up your workout clothes the night before? Or if you light a nice candle before yoga? Or maybe workouts are easier if you feel good about your shoes? I love when my feel-good habits also contribute to my feel-good workouts or movement choices. I’m always fascinated by what else motivates my friends to move and practice and pursue their favorite activities. What are your favorite habits in your pursuit of movement?